This pattern is easy for the novice crocheter, but the results can be stunning. Simplicity and yarn selection are the keys. It is light weight and airy, so that it can be used at any time of year, in any climate. Create the perfect baby shower or baptismal gift. This baby blanket will become a family heirloom. The afghan measures 32 by 40 inches (81 by 101 cm), not including the fringe. 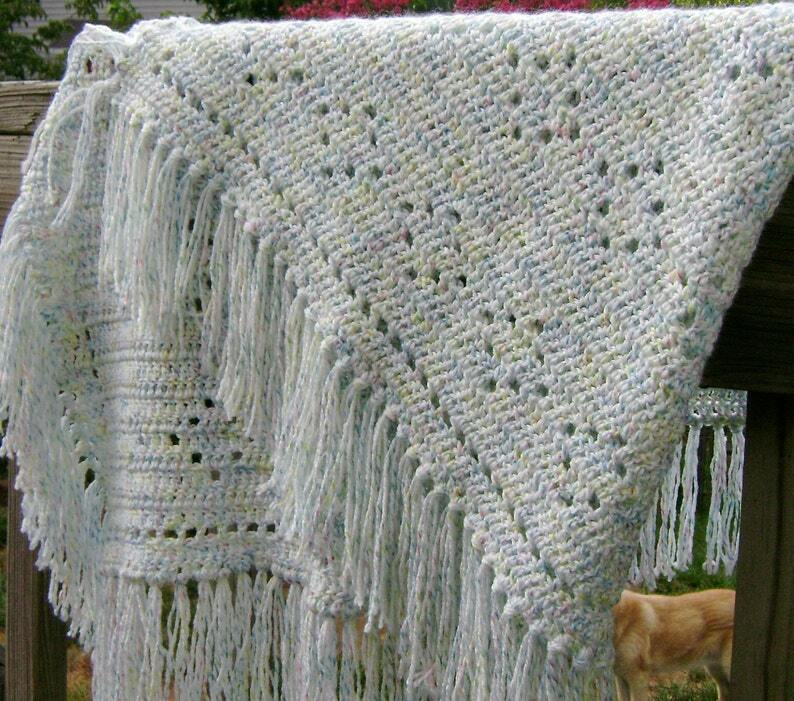 The simple diamond pattern shows off the yarn. I selected a beautiful but practical twinkle yarn, which is a white, sport weight acrylic yarn that has blue, yellow, pink, green and lavender nylon threads running through it, creating a shimmering effect. The pattern is in .pdf format. You can download it from Etsy once payment is complete. If you would prefer a printed copy, please contact me prior to purchase. I have made the instructions clear and concise, following crochet pattern standards we're all used to seeing in our craft magazines. If you have any questions about the pattern, please send them to me via email to DaffodilCornerNC [!at] hotmail.com and I'll do my best to answer them for you. Please note: The pattern is copyrighted by Eileen Flieg/Daffodil Corner. The pattern cannot be reproduced in any form. You may sell finished products that you create from this pattern, but I would appreciate credit for the pattern. If you are interested in a completed afghan, please contact me to arrange for a custom order. Thank you for shopping at Daffodil Corner!